We are pleased to announce a gorgeous litter of 7 f1b petite mini Goldendoodles born December 31st. Based on Buttercup their 24 pound mini Goldendoodle mom and Quantus their 17 pound mini Poodle dad, we expect this litter of puppies to be We love all of these Goldendoodles and it really is impossible for us to pick a favorite, but we are certain that they will make wonderful furry forever friends. We think they will be very devoted and loyal companions and easy to train. The pictures don’t do justice to these beautiful pups. We believe that these f1b Goldendoodles will make outstanding family members for a few fortunate forever homes. 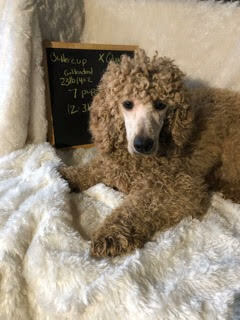 Buttercup, the Mini Goldendoodle mom; Buttercup’s guardian home prefers to give her a poodle haircut; even though she’s a Goldendoodle. Carmella is a gorgeous Goldendoodle girl who loves to be held and cuddled. She is very fun to play with, and we know that she will be great with kids. Carmella will make a lucky family very happy! Cinnamon has a sweet personality, and she loves to play with her siblings. 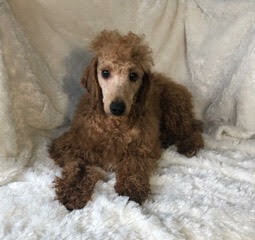 She has a gorgeous red coat that we think is going to get thicker and curlier as she grows. She will make a wonderful family member! Cozy has beautiful red fur that she loves to show off to friends and family. She will receive a ton of compliments for both her beautiful coat and cuddly personality. Cozy is very gentle and sweet and will be a wonderful furry family member! Chestnut is a gorgeous little puppy with a happy personality and a very affectionate nature. She is super sweet and gentle, and plays well with her siblings. We know that she will be a wonderful puppy to have as a furry family member! Crimson is a sweet little Goldendoodle that has been a joy to raise. She is super smart, and we think that she will be very easy to train. We will miss Crimson dearly, but we are excited to match her with her lucky forever home! Curly is a handsome red Goldendoodle. He is a sweet puppy with a deep love and loyalty to his siblings, and he will certainly turn heads when guests come over. We are confident that Curly will be a wonderful companion and best friends with his forever family! Copper is a gorgeous red Goldendoodle with a thick coat. He is a picture-perfect puppy, and couples his gorgeous coat with a loving, gentle, and cheerful personality. We know he will make a wonderful addition to any forever home!